I've been following your instructions and it doesn't work. What am I doing wrong? Longer answer: My guess is that you've been trying it by yourself, which is NOT following my instructions. Try it in a group of 10 people, and the chances are that a few will manage to get it working. I don't know why it's easier in a group, but it is. I suggest that if anyone runs professional workshops in your area, go along to one. It's the best way to 'learn' - that's how I did. Check out my links for the only ones I know about, and email me if you know any more so I can put it on the site. What do you think of Uri Geller's spoonbending? Since I'm not very talented at the whole spoonbending thing and even I can do it a bit most of the time, I can't see why there wouldn't be people who can do it a hundred times better. There are tens of thousands of people who have seen Uri Geller bend spoons etc - so it would have to be a pretty big (and pointless) conspiracy for them all to be wrong. When I was a kid, there was a media campaign to denounce Uri Geller as a fraud, and he was so over it all that he disappeared from the public eye for many years. Obviously, since I can bend spoons personally, I can't see WHY anyone would fake it when it's really possible (and not terribly difficult). So, I think Uri's 'powers' are probably exactly what they appear to be. In terms of what he DOES with those 'powers', he's a showman. My view of that, and of professional skeptics such as James Randi who cash in on the other side of the coin (ie, denouncing 'frauds' like Uri) is basically - well, that's their way to make a living but it seems like a bit of a dodgy way to make a living to me as it would surely involve a certain amount of... exaggeration? Embellishment? Manipulation of context... etc. If what you say is true, why haven't you claimed James Randi's Million Dollar Paranormal Challenge? Do you do this because you want to be famous? Argh, no way! Being recognised IRL (in real life) gives me the horrors. I would have preferred to keep off the site - but then, it doesn't work that way. People want to see who is behind a site, and being a cyberlebrity is really the only way to make an engaging & popular site. I'm always open & honest on my sites, but I don't feel it's really me on display. Or at least, it's such a small part of me that it's not significant. I'm reasonably well known as an author now - my real name's Kat Black and you can look me up on Amazon with my Golden Tarot. So being anonymous really isn't a possibility. I wish it was. I think I explain that pretty well throughout the site. I think it's an empowering thing to do, and there wasn't much info about it on the web. So, I made a site. It was popular, so I kept going. Bent fork sculptures are pretty too, and as a web developer it's nice to have attractive content to work with to showcase one's ability to build a website - although this 'out there' content isn't exactly going to get me paid, corporate work! I don't mention this site to clients generally. So really, it's just for personal interest. It doesn't make any money. The t-shirt sales and Amazon commissions don't even cover the site bandwidth. Is there anything else you'd like to do with it? Do you bend forks with your mind? No, I use my hands. I make them go soft enough to bend using some sort of 'mind' thing - chanelling or whatever you want to call it, but then I bend them with my HANDS. How long does it go soft for? Usually just a couple of seconds. How soft does it go? That really varies. Sometimes, it goes just soft enough for you to bend it using a bit of force (but I'm not talking white-knuckled, grunting and sweating levels of force). When it's working really well, though, it can go as soft as plasticene and you can easily bend it using two fingers. On one occasion, every piece I picked up went putty-soft immediately, and I could even roll up the bowls of spoons with no effort at all. Sadly, they don't usually go that soft - or at least, not for me. How can you be so sure it's not mind over matter, that you just THINK you're not using a lot of force? If you see someone do it (or do it yourself), that's really obvious. You don't need any leverage and there's no visible strain in your hand or arm muscle as you bend. Also, the shapes they bend into are far more fluid that would be possible with brute force (if I HAD brute force to use). Do they get hot to the touch? Before they bend, they don't get any hotter than your hand temperature. If you bend it very quickly when it's soft, though, the friction of the actual bend causes heat in the area that bent (not necessarily where you were holding it). Can you straighten them again? No. Especially if you do the bending quickly, the actual bending (not the 'softening' process) alters the structure of the metal causing 'metal-stress' or 'metal-fatigue' - it looks less shiny and smooth. Can you bend iron bars / nails / keys etc? I find it enough of a challenge to bend spoons and forks. I'm not some macho guy, I'm just a girl and I don't feel I need to push it any further. 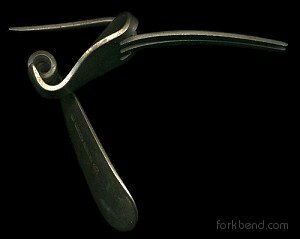 I can make pretty fork sculptures, and I'm happy with that. I don't want to be Uri Geller. Why don't you video it and put that on the site? After years of requests, now that it's free to serve video online, we have put up some videos, eg below. Personally, I think it shouldn't convince people any more than static pictures, as it would be easy enough to fake it. You decide. How do you take the photos on this site? Now, if you've read all of these and have something NOT answered here (or just want to say Hi) then you can email me. I get a LOT of email and don't have much time to answer it, sorry. Jasper made me a fork Valentine in 2003 when we first met, and we can finally put it online. Aww, he's so sweet. Yeah, he was being impatient so you can see he's using a bit of force. He didn't do the channeling stage and just went straight to the bending bit, hence fork not as soft as if he'd done the 'ball of energy' visualisation stage.